GROOMING - Our adopted dogs will arrive at their new homes clean and properly groomed. The new owner may learn how to groom their own Airedale at our annual grooming seminar. FIRST YEAR FREE MEMBERSHIP IN OUR CLUB – All persons who adopt one of our Sunshine Airedaler rescues automatically receive a free first-year membership in the Sunshine Airedalers of Florida club. You will be part of our network of Airedale owners in Florida and welcome at all our activities. During that membership year you'll be receiving the Airedale Chronicles newsletters. HONESTY – It is our aim to make a good match when placing a rescue dog with a new family. We will not misrepresent the dog we place in your home, and will try to match the dog to the waiting family. To assist us in making this match we must ask you many questions about your family, your lifestyle, your children and family members, and other pets in your home. Some dogs are not comfortable around small children, so we will want to place that dog in an adult only home. If you have other pets in your home, we will want to match you with a rescue dog that enjoys interacting with other pets. Please be open and honest with us as we plan to be with you. ADOPTION AGREEMENT – You can expect to receive from us a copy of the adoption agreement that you sign when you adopt one of our Airedale rescues. This agreement spells out what we feel are basic requirements for the safe and proper care of a pet. RETURN OF THE RESCUE – If for any reason, and at any time, the placement of this rescue with you does not work out, the dog MUST come back into our rescue program. This will be part of your adoption agreement. DONATIONS – If you adopt a rescue from us our minimum donation will range from $350 to $550. We provide quality medical care for our rescues and donations are necessary to continue this important work. We expect you to be a resident of the State of Florida. We prefer not to ship our rescues out of State. If you are from another state, we will be happy to direct you to an Airedale Rescue group that handles your state. We expect you to research the breed and make sure the Airedale Terrier is the breed for you and your family. Read all you can about the breed. Visit Airedales and their owners in your area, if possible. Read the information on this site and follow the links to more information. Decide if an adult rescue is the best choice for you and your family, or are you really looking for a puppy? Rescue rarely has puppies for adoption, and if you definitely want a puppy, we can refer you to reputable breeders. Do NOT buy puppies from pet shops or those advertised in the newspaper. An Airedale needs ample room for a reasonable amount of exercise, so we expect our applicants will have a fenced yard. We do not consider tying a dog outside an option to a fenced yard. Our experience with invisible fencing has not been all positive, so we do not consider it to be a reliable solution for a rescue dog. We will do a home check at your residence prior to the adoption. 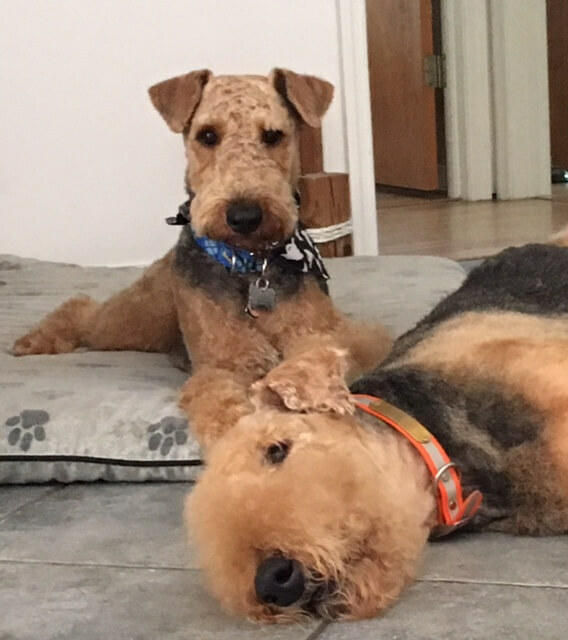 If you are interested in adopting an Airedale rescue in Florida, the next step is to complete and submit our Application for Adoption. Persons adopting one of our rescues will sign an agreement on the care and housing of the rescue, and will agree to follow up inspections by our volunteers. You must agree to return the rescue to our rescue program if for any reason the placement does not work out. We do not intend for our rescues to be outside dogs. We expect our rescues to be kept as inside dogs, as part of your family. We do follow up to check on this. When we place a rescue dog with an adopter, that dog will have been spayed or neutered. The dog will be up-to-date on all shots and current on heartworm preventative. We expect the adopter to keep the dog on regular heartworm preventative, to provide all future inoculations, and to maintain all routine and necessary veterinary treatment. We expect you to license your dog and see that your dog bears proper identification at all times. We expect you to happily make a contribution between $350 and $550 when you adopt one of our rescues. Our adoption fees are based on the age, health and temperament of the dog and can range from $350 to $550.